Are you an employer? Skills for Change has many services and programs to help support your needs. Let us help connect you with qualified candidates based on your hiring needs. We host job fairs on a regular basis for employers from all industries. 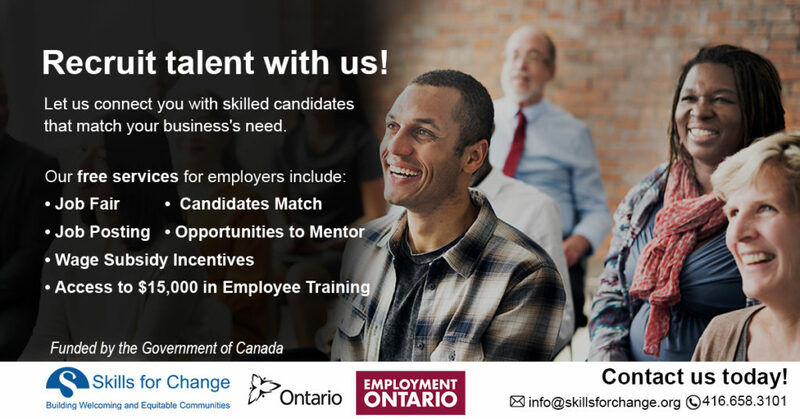 Participate in our next job fair hosted by Skills for Change. Need volunteers, interns, co-ops for your company? We can match you with skilled candidates based on your business’s need. Also, apply for different financial incentives for your employees including wage and subsidies incentives provided by the Government of Ontario. Need financial help in training your existing and new employees? Get grants of up to $15,000 in government support per employee for training costs. Looking for ways to give back to the community? Mentor new immigrants and refugees through our mentoring programs. Advertise job postings through our job board to reach a pool of skilled candidates we work with. We hold a wide range of events on a regular basis. Join us as a guest speaker for our events. We provide fast and affordable ways for your employees to build new skills. *Please note that the last service is not a free service and all proceeds go towards our programs and services for new immigrants and refugees.